Each year HubSpot surveys thousands of the world’s foremost marketers and salespeople about their priorities, challenges, and favored tactics, and publishes the results in an annual report. 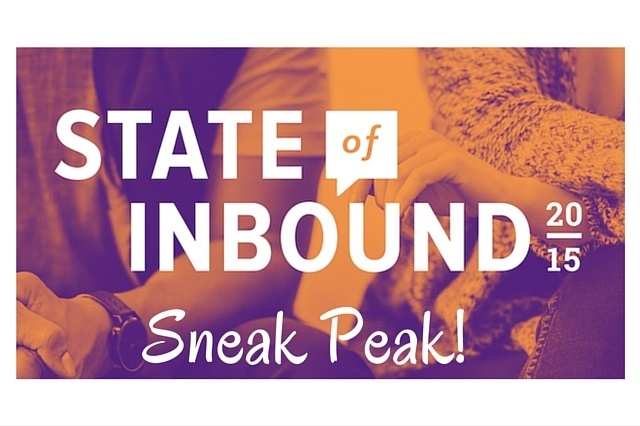 HubSpot’s State of Inbound 2015 reflects how those using inbound methodology have a leg up in the marketing world versus those who have yet to adopt it. (If you’re not familiar with inbound, be sure to read our post explaining Inbound Marketing.) Interested in learning more? Here’s your chance to get a sneak peek at the report. In putting together the report, HubSpot gathered data from nearly 4,000 respondents from more than 150 countries. The majority of respondents are marketers working for B2B small- and medium-sized companies with half of the companies generating under $1M a year in revenue. Only one-third of respondents have an affiliation with HubSpot. Inbound marketing is the core marketing strategy for small/medium companies (those with 25-200 employees) either fighting for growth or just beginning to enter the growth phase. Over six times as many respondents from companies with few than 25 employees cited inbound as their primary marketing approach. Companies with over 200 employees used both inbound and outbound marketing strategies equally. Viewed in terms of marketing spend, inbound is the preferred marketing approach for the majority (58%-83%) of companies with marketing budgets under $5M. In short, it doesn’t matter who your customers are, inbound is the preferred choice for reaching them. Companies are three times as likely to see higher ROI on inbound marketing campaigns than on outbound. This holds true across different company sizes and budgets. Only 8%-18% saw higher ROI using outbound. ROIs benefitted from an inbound approach, no matter the size of marketing spend. Tracking and proving positive ROI in turn resulted in increased marketing spend. Respondents were 20% more likely to receive a higher budget in 2015 if ROI was tracked in the first place, and twice as likely to see an increased budget if that tracked ROI was shown to be higher than in 2014. Organizations that saw an increase in ROI from 2014 to 2015 were more likely to employ both staff writers and guest contributors for content creation than less successful organizations. Respondents who achieved greater ROI in 2015 than 2014 were approximately 20% more likely to check their marketing analytics three or more times per week. Marketers recognize that inbound is an ongoing strategy that gets better with iteration. According to HubSpot, both past success and past failure with inbound correlate with an inbound marketing budget increase. 81% of those who experienced a past failure also increased budget as a result. Prospecting is the most difficult step of the sales process. Salespeople lack vital information before they reach out to leads. Despite articles declaring the end of field sales, hiring data shows that outside reps are getting hired at approximately the same rate as inside reps.
Executive buyers don’t trust salespeople. To regain credibility, salespeople should use helpful content and become active on social networks. If you’d like to learn more about inbound, simply click here to access the full State of Inbound Marketing & Sales 2015 Report.